Heavy Planet : Album Review: Junius - "Reports from the Threshold of Death"
Album Review: Junius - "Reports from the Threshold of Death"
Given the slew of dark, earthen sludge and doom I've gushed and fawned over in recent months, it's a different approach taken when an album celebrates and obsesses over life rather than death. Muddled plod and whiskey-drenched rasp is today traded straight up for clean exaltation and layer after layer of cool, dreamy awe. Reports from the Threshold of Death is the sophomore full-length from Boston space-rockers Junius, who meld fuzzy shoegaze with moon bounce under a gorgeous hooded hum that'll make short work of enlisting fans. Leaving behind excess and caveman-clubbed grind, the album takes art metal in directions where ambition often drowns effective songcraft. Despite its cosmonaut navigation, the album's organic maturity is what busts through the seams. An otherworldly congregation of voices is joined by the crunch of guitars on Betray the Grave, the album's surprisingly hopeful opener. Sure, there's a low, drudging rhythm shadowed beneath Joseph Martinez's gentle, rolling vocals. But the parity of sounds and moods leaves you wondering where this band is headed. 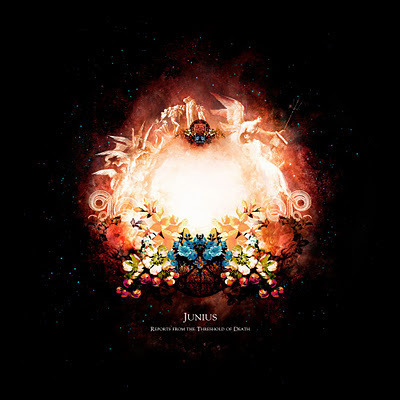 You may just want Junius to cradle you in a rocking chair and sing you to sleep. Keys and synth are heavy on All Shall Float, a sonic dreamscape of clouded bliss. Anyone familiar with Hybrid's Wide Angle may stagger under the track's broad scope and choir of layered hymns. Dance on Blood is more reserved, as Martinez's vent dips and softens over low rumble hits. Dana Filloon's drumwork lays a foundation of laid-back rhythms that build to a pounding salvation. The track adds sonic panels one after another, while A Universe Without Stars enters to peel them away. What's revealed may appear as post-grunge groove, but thankfully there's no shiny whine licking these boots. The lyrics preach complacency as Filloon's skins again pummel and marry the hovering synth and brooding guitars. The album's thorax is as emotionally charged as it is ethereally longing. Haunts for Love is an early morning mist of perfectly executed time signatures, though the lyrics grow painfully personal and steal the song. The buzzy, creeping feedback of The Meeting of Pasts is a soaring feat, delivered on strings between soup cans. The pauses, followed with the undeniably heavy drop of rhythms, may just be the album's most effective moments. The ambient (Spirit Guidance) is a ghostly, buzzing intermission before the album's closing triptych enters. Towering, lucid beauty floats, though there's no aimless wander on A Reflection of Fire. A shrill hum ribbon sets the tone and Joel Munguia's bass feeds tempos with excellent restraint and assault. The song is hopeful and thankful, pleading for further help. The vocal and rhythmic menagerie of Transcend the Ghost shifts under Michael Repasch-Nieves' light, lilting guitar. Buzzing and intermittent, elements of Hum are only semi-evident as the song drifts and melts away into itself. The cosmic warble of Eidolon & Perispirit grows under a tapestry of space odyssey keys, fuzzy with intensity. Imagine those movies where snotty kids build backyard space stations and somehow find a way to shoot through the atmosphere. You can feel the track building toward a coup, and the stormy blast that follows, though predictable, is perfect. Your ears were ringing before the album even closed. For all its progressive technological realizations, Reports from the Threshold of Death's finest moments are its most natural and most human. We'd be missing the point if we didn't highlight the album's messages of hope and existentialism. Each of these ten tracks, though born of harrowing loss, manages to uplift and enchant. Consummately, the album is daunting and wildly fulfilling. Open up, pull those heart strings, and give this slick, snowy collection your most honest gasp.